Televisual has created a short HDR film to showcase the beautiful scenery in and around Hever Castle. The film, captured on Panasonic cameras with Fujinon lenses, shows the castle in all its vivid and colourful glory. There’s a great deal of buzz and industry excitement around High Dynamic Range (HDR) at the moment. In short, HDR adds a whole new aesthetic to images, creating brighter, higher contrast pictures with much more vivid colours. As with any new development, there is a fair amount of uncertainty about how to go about producing HDR. Televisual decided to find out for ourselves by producing our own HDR 4K UHD fi lm. For the shoot, we partnered with Panasonic and Fujinon, to source industryleading 4K cameras and lenses. To make things fun, we gave ourselves an extraordinarily tight deadline of less than a week from start to finish to complete the production. 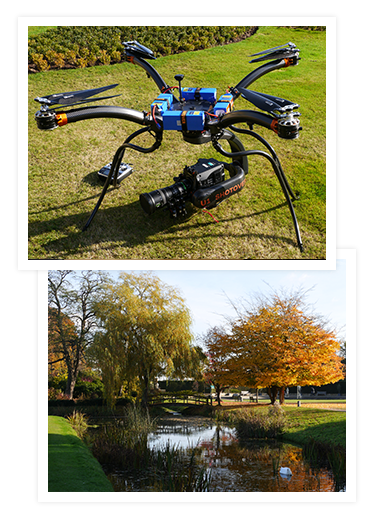 The resulting fi lm, which is a minidocumentary about Hever castle in Kent, was shot in-camera on the Panasonic VariCam 35 and VariCam LT, with Fujinon’s cine-zooms (including the new ZK25-300 and XK20-120) and edited in Avid Media Composer, before a grade in Digital Vision’s Nucoda. There have been a number of significant developments for HDR over the last month, with YouTube adding support for HDR content and the UHD Alliance having formally included HDR in the UHD Premium spec. What all this means is the floodgates are now open for anything and everything HDR. The Hever castle shoot gave us the opportunity to shoot high contrast interiors, delicate dawn colours and rich autumn colours in bright sunshine – a challenging test for the cameras and lenses. Over the following pages, those involved in making the film explain what they’ve learned about producing and posting in HDR. This is one of the first shoots I’ve done with the Panasonic VariCam 35. The menu system was quite intuitive to use – I found myself, after about 10 minutes, working out how to get to everything I needed to get to. The buttons seemed to be in the right place and you could confi gure them as well, which is good. The display on the side is very clear too, so I think, as far as using the camera goes, it’s very straightforward. The camera provides a very cinematic image, which was very pleasing. Using the AVC Intra 444 codec in 4K obviously gives you the 4K resolution, but it also gives you the 444 colour space, which means you’ve got much more ability to grade that image. On any camera system, I think it’s really important to be able to record in-camera. It makes a big difference to be able to shoot that high resolution and that colour space on a card internally. Otherwise, you have to start adding other systems and boxes to it and it just over-engineers the situation. It’s much better, in terms of being at the sharp end of filming, to have a system that’s built in. The camera stands up in a variety of shooting environments – low light, mixed light, candle light – capturing lots of different hues and colours. I shot at ISO 800 throughout and the noise level on the blacks, the retention of the highlights and the tonality of the colour is very good. It really does capture an image with a great cinematic aesthetic. Most of the time there’s a compromise with a zoom lens – you’re actually throwing away quality to be able to get that flexibility of being able to change frame size very easily. But one thing I find with the Fujinon HKs is you’re actually getting near-prime quality – this amazing image, this wonderful resolution, this great colour tone. They are really nice to handle too. When you want to do a little move, you put your hand on there and it’s got a lovely feel to it. With some zooms these days, you find they don’t have that kind of fluidity to them. Using the HK 75-400 on the lake house shot at Hever castle was a good example of showing the change in focal length of that lens; being able to get in close to something very far away and slowly zoom out to reveal the foreground. You just get this constant quality throughout the length of the zoom, it’s like a variable prime. Meanwhile, the great thing about the Fujinon ZK25-300 is the range it covers. It’s one of those ‘catch all’ lenses. The Atomos Shogun Flame is a really good looking monitor. It can give you a really good idea of exposure and colour tone. But the fact it’s 4K HDR – that’s where it really comes into its own. It’s actually a lot more usable than a standard monitor. You always have that situation with standard monitors where if you’re out in any sort of light, bright daytime situation, you have to cover your head with a coat. The great thing with the Atomos Shogun Flame, because it’s a HDR monitor, is it’s much more readable in daylight than a standard monitor. This was the maiden flight for our new Shotover U1 drone, which is a super heavy lift UAS with a maximum operating weight of 35kg. The weight of both the VariCam LT and Fujinon XK6 lens were comfortably included onboard. The VariCam LT’s menu system was immediately familiar and we had no issues fi nding the settings we required and controlling the camera on the drone from the ground. Working with drones, you want as few on-board elements as possible and recording in-camera is nigh on essential. The VariCam LT records AVC Intra 4K 422, 10-bit in-camera on P2 cards. The super 35 sensor allowed us to record a true 4K pixel count that can be graded to beautiful HDR. To be able to shoot cinematically in true 4K with a drone is relatively unique. This film needed to be edited ready for the grade over a weekend, in order to be shown to the client. So speed was of the essence. I had a list from the producer of the selections he wanted from the shoot. He was able to make this list in a hurry by using the Atomos Shogun Flame. The producer watched the rushes from the Shogun as a proxy fi le in HDR, immediately after they were captured. I took his sequence of selects and rendered it as an HD sequence. I then edited that HD sequence and linked it back to DNxHR444 transcodes, and that’s what we brought into the grade. It looked amazing on the HDR reference monitor – it really has blown me away. What really impressed me, looking at the HDR, is the shot where the subject in the fi lm comes and peers at these 16th Century books. The light lighting the scene is just a small light coming from a cabinet so you’re seeing dynamic range there that’s extraordinary in the true sense of the word. HDR is a bit of a buzzword in the industry at the moment and I think people are really sceptical about buzzwords, especially as we’ve had 3D and that was a failure, and we’ve just gone to UHD. But HDR is the future of television displays and really does have the ‘wow’ factor. The HDR images from Hever Castle are fantastic, with really deep colours. It opens up a whole new world for grading. They are amazing, vivid images. What you have with HDR is an incredible thing to work with; the images are staggering. The Nucoda Film Master handles HDR really well. What’s great is the workfl ow is easy, because you’re working as you always have done, with the same tools you always use. To grade HDR you obviously need HDR monitoring, but that’s really it – the fact the Nucoda can handle the HDR and put it where it needs to be allows you to just concentrate on making that image how you want it to be. My first impression of HDR is, at last, we can really just concentrate on beautifying the image rather than having to compromise. It needs very careful work but what you’re doing is just enhancing the image and making it better. When grading in SDR you’re trying to pull enough information out of the blacks without clipping the whites. And that usually means windowing out areas of the picture. But with HDR, it’s all there, which allows you to shape and grade exactly how you want it to be, without having to rescue whites or bring out blacks. I should issue a word of warning, though – the flexibility provided by grading in HDR could potentially be a bad thing, if you don’t keep the grade in check. I love the images but you have to be careful to not over-crank them or you could end up with hyper reality, which wouldn’t look good. We were in at the deep end a little with this, with just a few days to prepare. We were working with the Panasonic AVC Intra codec, shot in 444, 12-bit from the VariCam 35 and 422, 10-bit from the VariCam LT, both in 4K. I wasn’t sure what to expect from the material but I was impressed with the results. I saw the material briefly beforehand, and then on the day of the grade. The media was prepared by transcoding it into DNxHR444 and DNxHD. The edit was done using the DNxHD material and the DNxHR444 was used for the final conform and grade in Nucoda, via AAF from Media Composer. Vince is a long time user of Nucoda and quickly realised the potential HDR could bring to the grade. The Panasonic V-log format was easy to work with and the picture quality was excellent. The drone shots and the misty lake shots were beautiful, everything on the water was clear and sharp. Care was taken to provide images that would show how HDR could be used to enhance and not dominate the image. The Panasonic VariCam line of cameras has been used on a wide variety of movies, commercials, and TV programs, and is renowned for its colour reproduction and for bringing progressive workflows to the production industry. The VariCam 35 boasts the highest-quality images of the new VariCam series. It features a dynamic range with 14+ stops of latitude and a wide colour gamut and acquisition functions that support 4K/120fps uncompressed RAW recording. It offers a highly innovative workflow with dualcodec recording, in-camera colour grading, and a modular design with superlative durability, system expandability and operating ease. The Cinema VariCam LT provides outstanding image quality in a compact, lightweight magnesium body. It offers the same picture quality specifications as the larger VariCam 35 cinema camera, with the same super 35mm image sensor. It features a wide dynamic range of 14+ stops, an expansive colour gamut and high sensitivity for 4K image acquisition. It has dual native ISO settings of 800 and 5000, for clean shooting in very low light situations. The Hever Castle HDR project used a comprehensive range of Fujinon cine-zooms, including the premium HK 14.5-45mm, 18-85mm, 24-180mm and 75- 400mm, as well as two significant additional models in the Fujinon cine-zoom range. The Fujinon ZK 12x25 (25-300mm) offers an industry-leading 12x zoom ratio to cover the most frequently used 25mm wide angle right up to 300mm on the telephoto end. With its advanced optical performance supporting 4K cameras, the lens delivers premium image quality across a versatile range of shooting scenes. The ZK 12x25 features high-precision large-diameter aspheric elements, designed with Fujifilm’s proprietary cutting-edge optical simulation GO-Technology. The competitively priced XK 6x20 (20-120mm) digital cinema camera zoom lens offers high optical performance compatible with 4K cameras, with comfortable operation. The XK 6x20 is equipped with a detachable drive unit for electronic zooming and focusing and features 0.8mm gear pitch for compatibility with standard cine accessories. The Fujinon lenses delivered stunning HDR pictures. The Atomos Shogun Flame had dual uses for the Hever castle shoot: for on-location HDR monitoring and for recording an HD HDR proxy. The HD HDR proxy was ideal for immediately reviewing content and for making picture selects ahead of the edit. HDR monitoring is critical for improved focus and exposure (which can be tricky when shooting in log for HDR), and enabling checking Atomos of the quality of the log footage while still on location. The Nucoda grading software combines an expanded creative toolset with support for AAF and XML, ACES colour management and is HDR ready. The industry leading image enhancement tools allow users to get the best out of their images. You can work in resolutions up to 4K 60p. Control is provided by the Precision control panel, designed for Nucoda, or using the Tangent Elements. All commands are fully mapable, which allows the user to customise their grading experience. Nucoda includes DVO Classic, a special tool set consisting of DVO Grain, DVO Aperture, DVO Regrain and DVO Brickwall. Nucoda provides full support for HDR 10 and Dolby Vision. Media Composer now supports HDR workflows, enabling you to edit and grade projects using new colour specs that display a greater dynamic range than standard video. Enhance colour and contrast to achieve more realistic, dramatic imagery, with exceptional detail in the shadows and highlights. And with native support for 2K, 4K, Ultra HD, and 8K media, you can acquire, manage, edit, and deliver content quickly and easily. G-Technology’s roots are ingrained in delivering premium storage solutions for audio/video production, photography and the professional content creation market. From storing, transferring, editing and distributing content, G-Technology makes the workflow simpler and faster. Its portable and desktop drives, flexible transfer/edit solutions and fast RAID systems are all G-Tech built for professional content creation environments. MIST revolutionises the mastering process by offering unrivalled features for the creation of any type of masters or file packages from any type and resolution of source media. From the RAW data to the final project, MIST provides dailies management, multiple formats transcoding, extensive editing and conforming tools, advanced colour grading and colour management features, image enhancement and conversion tools.